The Bukowski Agency - Where Am I? An experimental psychologist at the University of Waterloo in Ontario, Canada, Colin Ellard's main interests are in animal behaviour, cognitive mapping, human navigation, neuroscience, urban planning, and environmentalism. His research in most of these areas has been supported by funds from national granting agencies and published in international scientific journals for more than twenty years. 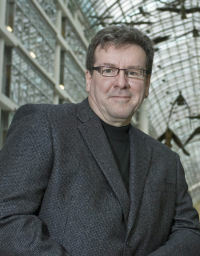 He has travelled widely for both research and pleasure, and has worked at several universities both in Canada and abroad. This is his first book aimed at a general audience. He lives and gets lost frequently in Kitchener, Ontario, with his wife, six children, a dog, a turtle, several fish, and the occasional gerbil. We’ve all been there: wandering around a multi-storied parking garage searching for our car or wondering which direction we’re facing when we emerge from the subway. Yet our dogs remember exactly where they buried a chew toy three summers ago and ants in the Sahara find their way home after travelling a distance equivalent to a marathon. 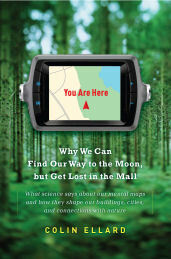 In You Are Here, Colin Ellard explains the human proclivity for getting lost, comparing our ability to process physical space to the far-superior skills of animals normally considered less intelligent than our own species. 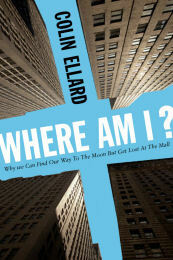 Ellard describes the mental maps we develop to ease everyday navigation, whether it's noting a striking landmark or leaving a virtual trail of crumbs to find our way through the woods. Travelling through natural, man-made, and even cyberenvironments, he offers sage and often amusing insights into the spatial design of everything from office cubicles and family rooms to malls and casinos, explaining why so many spaces fail so spectacularly. From entertaininganecdotes to eye-opening facts to advice on how we can become environmentally responsible citizens, You Are Here provides a valuable perspective on the world and our place in it.